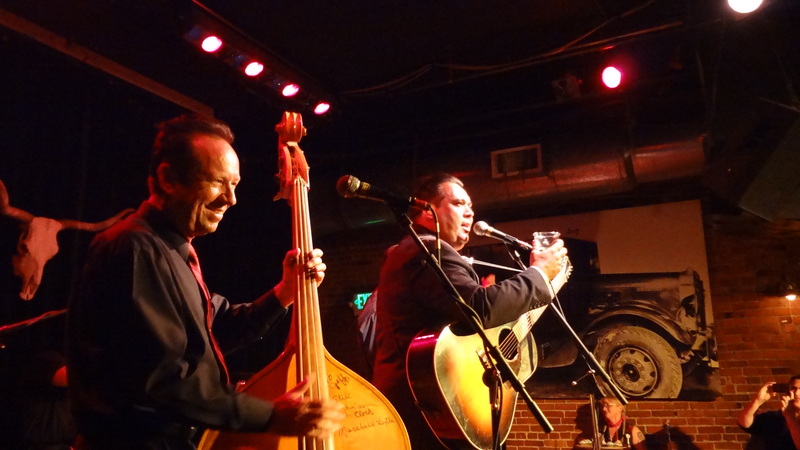 Big Sandy and His Fly-Rite Boys delivered that rockabilly beat to a joyous crowd at Seattle’s Tractor Tavern. 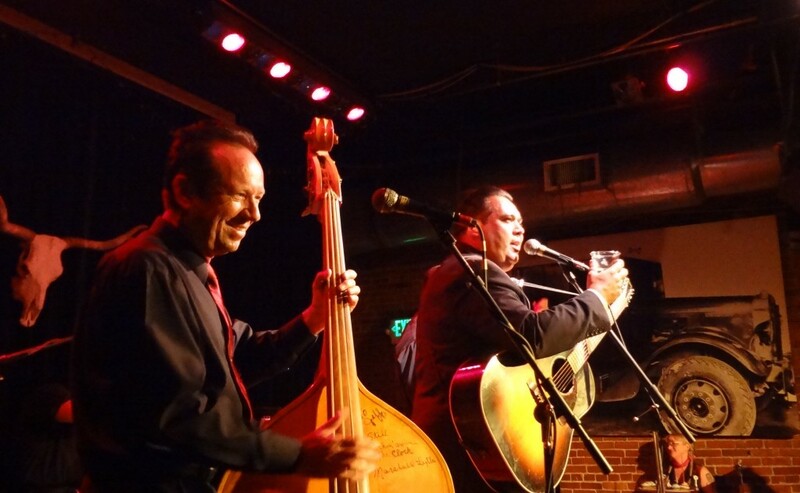 They are a major part of a growing rockabilly/roots/western swing revival which also includes Los Straitjackets founder Eddie Angel and his other band The Planet Rockers, The Hi-Risers, Seattle’s The Black Crabs, Marshall Scott Warner and others throughout the country. 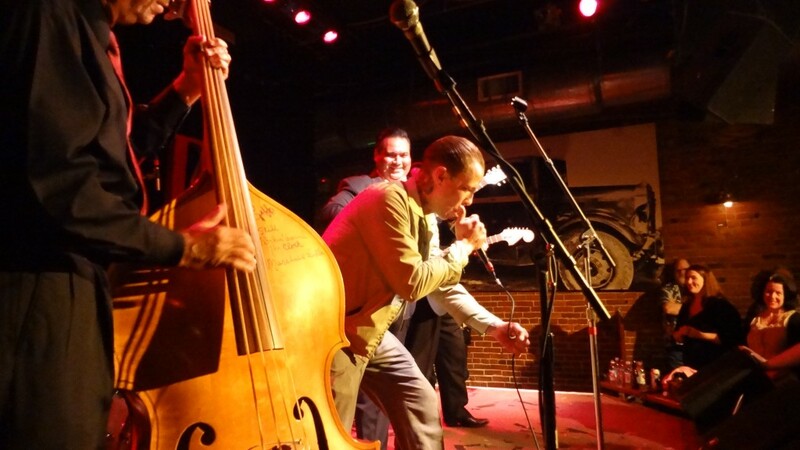 A culture of rockabilly fans sprung up around these bands. At this show, we saw greasers with lamb chop sideburns, leather jackets, cuffed jeans, pretty girls with coiffed hair and short bangs, tattoos (a more modern twist to the retro style), heavy eyeliner and false lashes, skirts made for swinging and patent leather shoes. The Black Crabs, led by Johnny 7, opened the show. 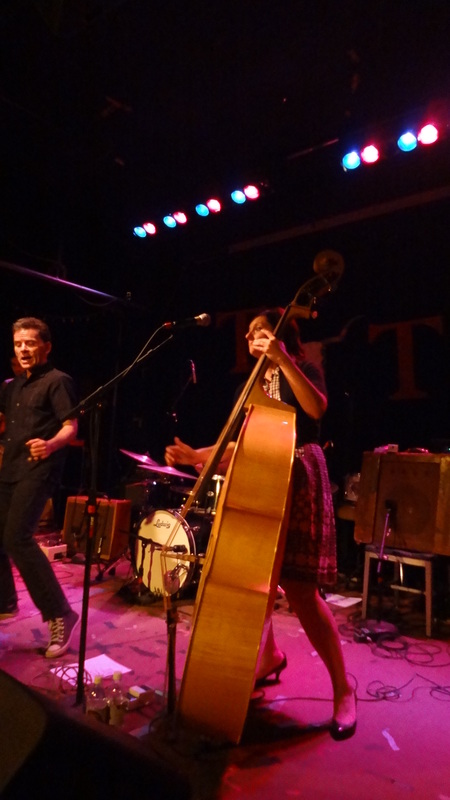 They play locally and worldwide at rockabilly festivals and backed Rockabilly Queen Wanda Jackson at Bumbershoot a few years ago. Johnny’s pinky finger was still in a brace after it found itself in a dog’s mouth a few weeks ago; he had the skillful Nick Streeter sub while Johnny stuck to vocals and gyrating and posturing all over the stage. Johnny gave Streeter props for filling in for him and doing a swell job with the various stops, tempo changes and complex rhythms. 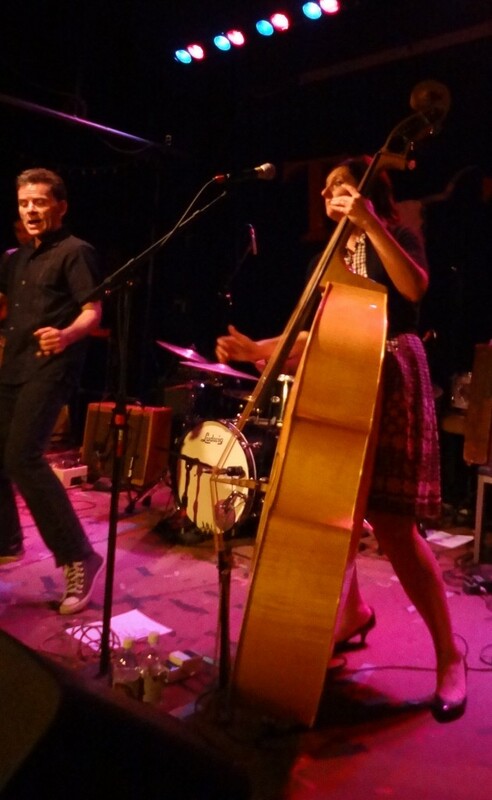 The fabulous Kirsten Ballweg pounded on the upright bass with vigor, and Tom Forster kept the beat steady on drums and followed Johnny’s cues. They were cool cats (or crabs) and full of fire. The crowd still hadn’t filled in, but there was room to dance; and the skilled and not-so-skilled pairs gave it a shot. I enjoyed watching them and wished I’d taken lessons. The Black Crabs played my favorite song, “Thirteen Times” early in the set. Ballweg and Forster got turns at solos while Johnny 7 belted out the lyrics with such enthusiasm it made me smile. I like Johnny’s vocal quality and how he draws out his vowels for emphasis. It was hard not to tap a foot or nod along to this one. Check out the streaming songs on their Facebook page. Another bass solo from Ballweg on “Black Cat Boogie” showed us that she’s not just another pretty face in a skirt. The girl can play with gusto. 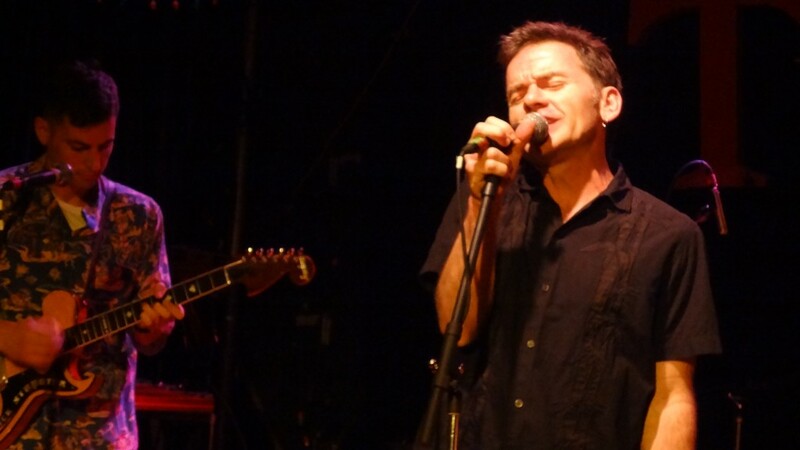 Ballweg also sang lead vocals on “Stop Messin'”. “Doorknob” is another fast number that kept the audience moving. While they played, dancers twirled and swirled around, and I felt immersed in a different era. There was an older couple sitting behind us who were smiling, swaying to the music and possibly remembering bygone days. I wished my parents were there. The joyful, upbeat tempo and smiles on the musicians’ faces spilled onto the audience who fed it right back to the stage with their own smiles, cheers and dance moves. This is exactly why I love live music: The Yin to balance the Yang. One can forget about all the unpleasant parts of life and take a few hours to savor one of the greatest pleasures of life. 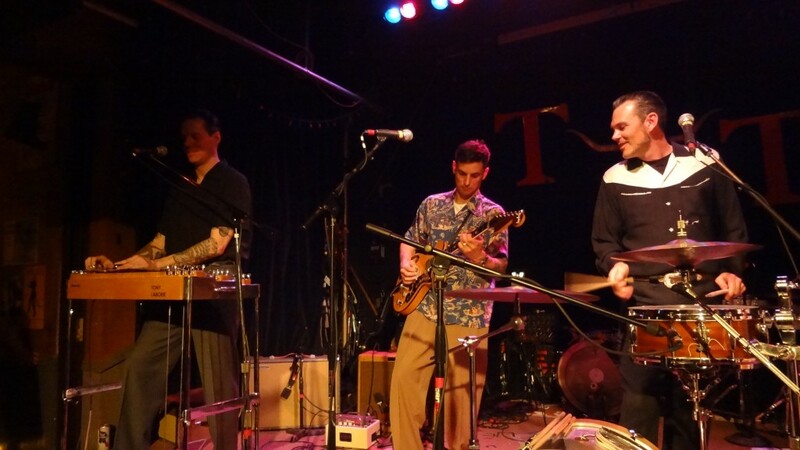 He began the set with “Juke Joint Johnny” which had a definite country twang with the added pedal steel from LaBorie. Marshall’s voice has more of a classic country sound which fit in with the pedal steel quite nicely. I also enjoyed seeing a kickdrum frontman for the first time. Tony LaBorie got a chance to sing “Love Gets In the Way”. Tony was a joy to watch up close. 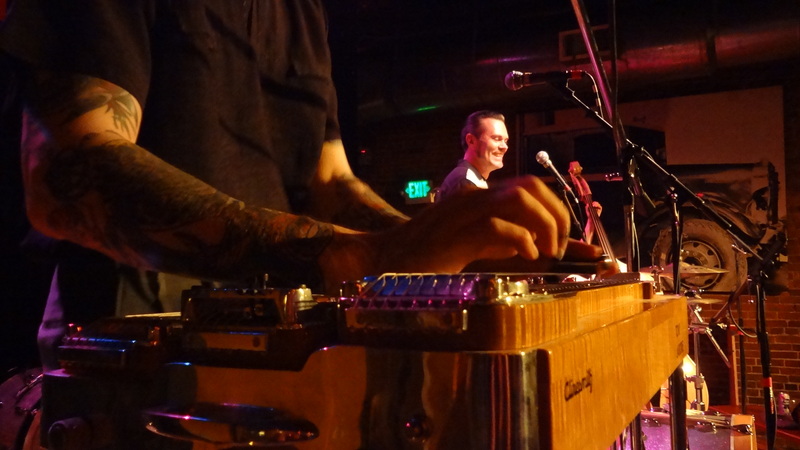 I was amazed at the dexterity and coordination it takes to work the pedal steel. During intermission we caught our breath, grabbed some water and rested on our little table next to the stage. The crowd filled in around us, but people were courteous and kept space between them. There was still room in the middle of the floor for dancing. 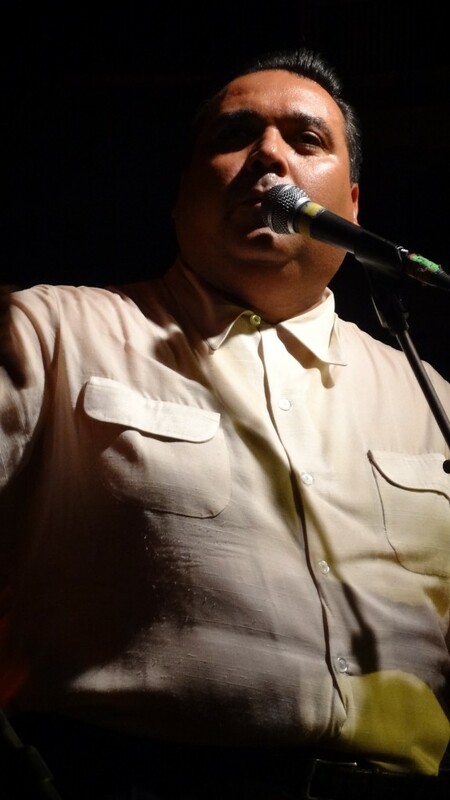 I spoke to Big Sandy briefly at the show, and he was kind enough to answer a few more questions via email. 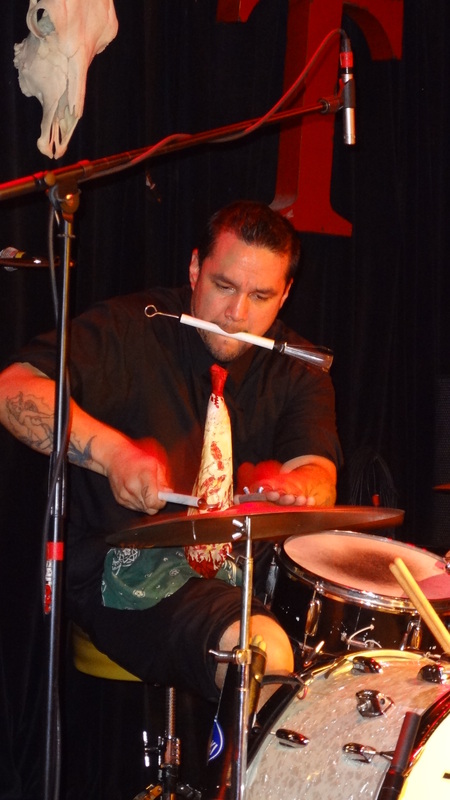 The current band members are from the Anaheim/Orange County region of California and have been playing as a band with various members since 1988. Ashley Kingman, on electric guitar, has been in the band for 19 years. 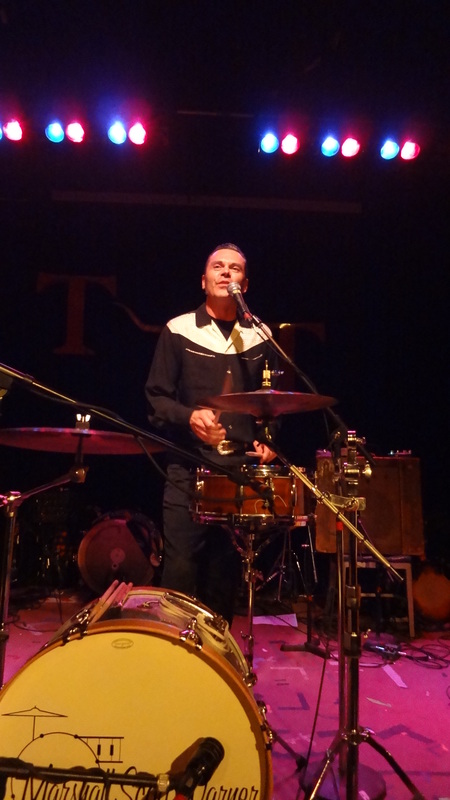 Jeff West, on upright bass, is a close second with 13 years in the band. Drummer Joe Perez, a six-year newbie, is also known as “Lil’ Sandy” according to the person yelling the moniker behind me at the show. 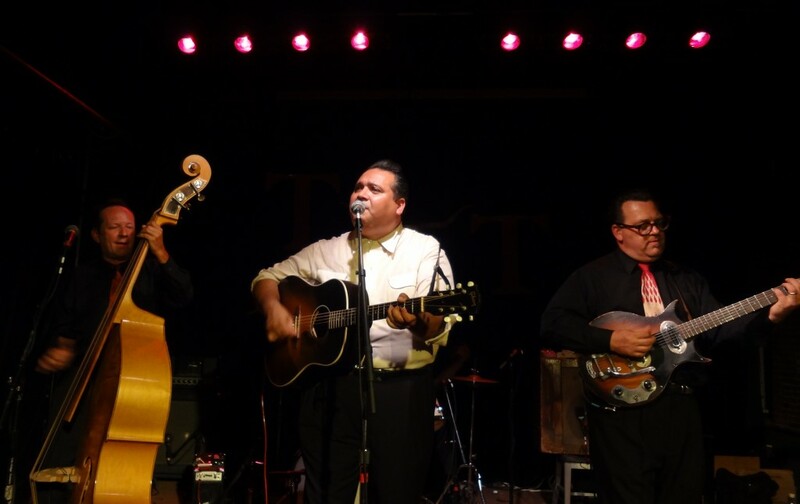 The boys have played The Tractor many times and always have a blast, according to Big Sandy; although this is the first time they’ve played there in three years. I kicked myself for not attending their show before. 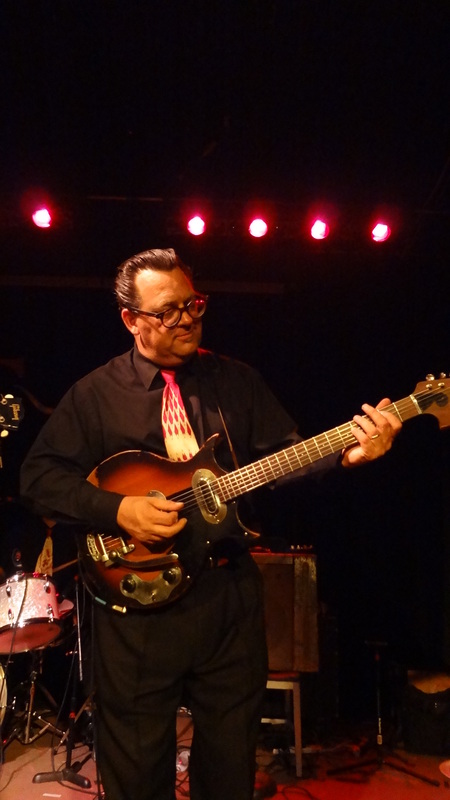 He occasionally sings for Los Straitjackets and enjoys performing with them because there is no pressure to organize the tour; he just shows up and sings. 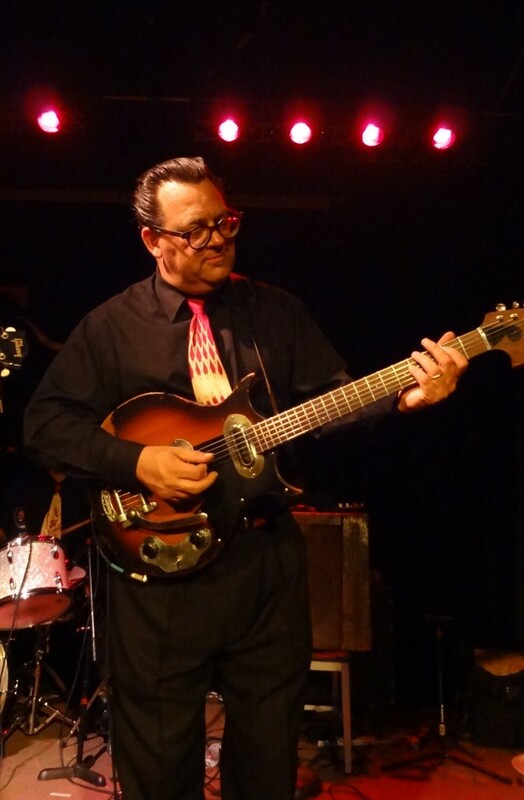 He will play Finland, Sweden and Spain with Los Straitjackets this year. 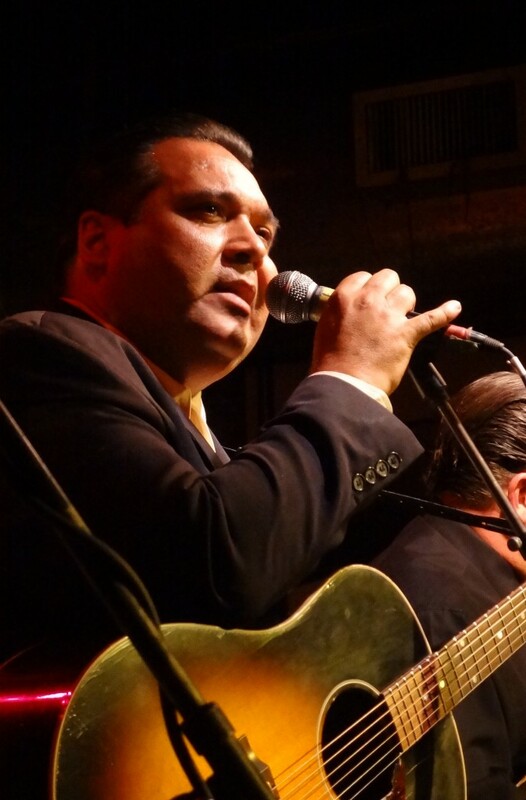 Big Sandy and The Boys are currently putting the finishing touches on an acoustic album over the next couple of weeks, and I am sure it will be a welcome addition to their prolific music catalog. 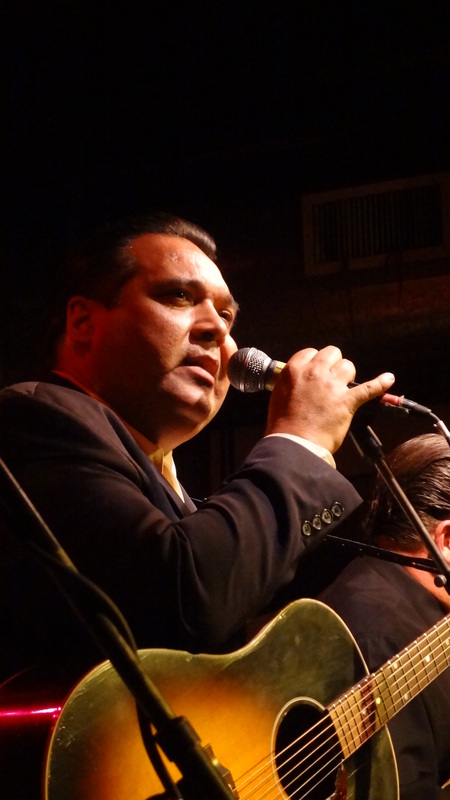 Big Sandy and His Fly-Rite Boys hit the stage running to a loud roar of cheers and applause. They jumped right into “Hey Lowdown”, then had to stop briefly for tequila and cupcakes to celebrate Marshall Scott Warner’s birthday. Sandy later dedicated “Little Cabin on the Hill” to Warner for his birthday. The setlist was a two-column mix of older and newer material which Sandy said he adjusted depending on the mood of the crowd. He called songs out to the rest of the band as throughout the evening. The veteran band’s bond was obvious; they followed Sandy’s lead and quickly adapted to any set changes. The list also included songs from a new vinyl 45 record currently available. The “A” side is entitled “My Eyes Are Open But There Ain’t Nobody Home” and “B” side is a Conway Twitty cover called “Don’t Get Too Far with the Girl At The Bar”. “Miss Tracy” one of my favorites, shows off each musician’s talents. Humorous interruptions broke up the long set. More tequila showed up onstage courtesy of a fan. 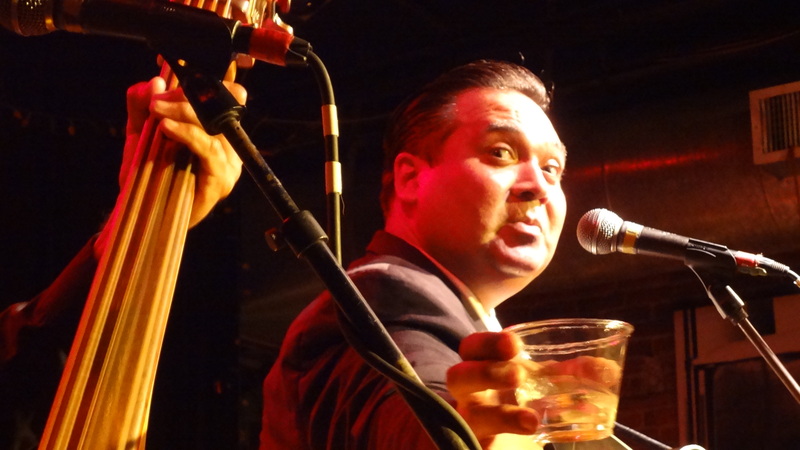 “This smile comes courtesy of Don Julio!” exclaimed Big Sandy, whose velvety voice is as smooth as a shot of top-shelf Reservo. Later, Sandy called up a guest singer that sang in his best death metal voice to one of their songs and had the audience in hysterics. 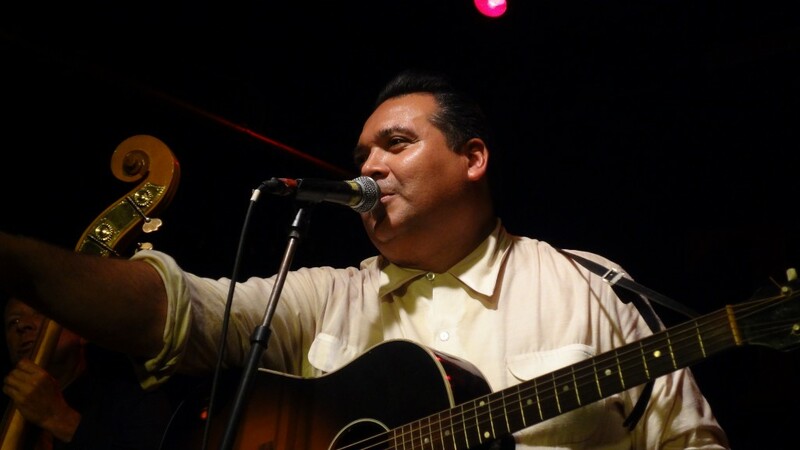 The crowd shouted out song requests and Big Sandy chatted them up, seemingly knowing or at least recognizing a vast number of people in the crowd. He checked in with me a couple of times to make sure he was doing alright. I smiled and raised my glass. Jeff West smiled literally the whole time and sang lead on “Make Me Mad”. At the end, he said coyly, “Not really!” The way West smiled, I couldn’t see anything making him mad. He slapped the crap out of that bass, so maybe he gets his aggressions out through his music. His bass was signed by Marshall Lytle, the original bassist for Bill Haley and The Comets. “The Greatest Story Ever Told” included jazzy solos by Ashley Kingman. 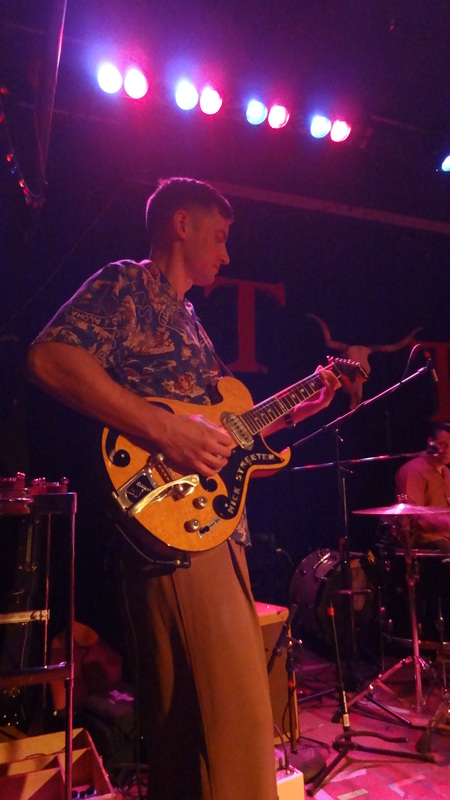 Kingman, whose quick-fingered sound had more of a jazz tone throughout, made playing guitar look effortless. He raised the guitar neck up to emphasize a run or chord and occasionally turned the tuning peg down to drop a step or two on a couple of songs to hit that lowwww D. He wasn’t the most animated guitarist I’ve seen; but his playing was so perfect, he didn’t need a gimmick.